Riding all-terrain vehicles (ATVs) can be a fun way to explore nature and enjoy the outdoors. Unfortunately, however, it can also put people at risk of being involved in serious accidents and, in turn, sustaining severe injuries. Below, we’ll highlight some of the most important facts and statistics to know about ATV accidents. Then, we’ll reveal what you can do to protect yourself and minimize your risk of being in an ATV accident. Knowing these facts about ATV accidents, as well as these safety tips, can help you reduce your risk of a crash, a Littleton personal injury lawyer explains. 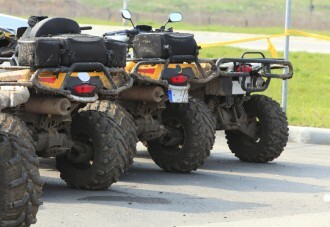 On average, roughly 800 people die as a result of ATV accidents each year in the U.S. Annually, approximately 100,000 people in the U.S. need to seek emergency medical treatment after being in an ATV accident. Nearly 1 in every 4 people injured or killed in ATV accidents is a child under the age of 16. More than half of all ATV accident injuries treated in emergency rooms involve head or upper body injuries, with lacerations, contusions, concussions and bone fractures being among the most common injuries sustained and treated. About 1 in every 3 ATV accidents occurs on paved roads. The top five states with the most reported ATV accidents include (in order of most to less accidents) California, Texas, Pennsylvania, West Virginia, and Kentucky. Get safety training – Along with getting training before a first time riding an ATV, it’s also important to brush up on this training every few years or so. Always wear protective gear – This should at least include a helmet, gloves and long pants. Never over pack ATVs with too many riders – Only carry as many passengers as the ATV is built to safely contain. Stay off of paved roads – Interactions with standard passenger vehicles on paved roads increases the risk of ATV accidents. So avoid riding on these roads, and if you need to cross one, do so with the utmost caution. Make sure an adult is always riding with children under 16 – In other words, don’t let children ride ATVs by themselves. Do you know any avid ATV riders? If so, share these ATV facts and safety tips with them. And share your comments and opinions about ATV accidents with us on Facebook & Google_. For help with your financial recovery after a motor vehicle accident, contact the Littleton personal injury attorneys at Bahr, Kreidle & Flicker. Since 1983, we have been fighting on behalf of injured people and aggressively standing up against injustice, inequality and intolerance.